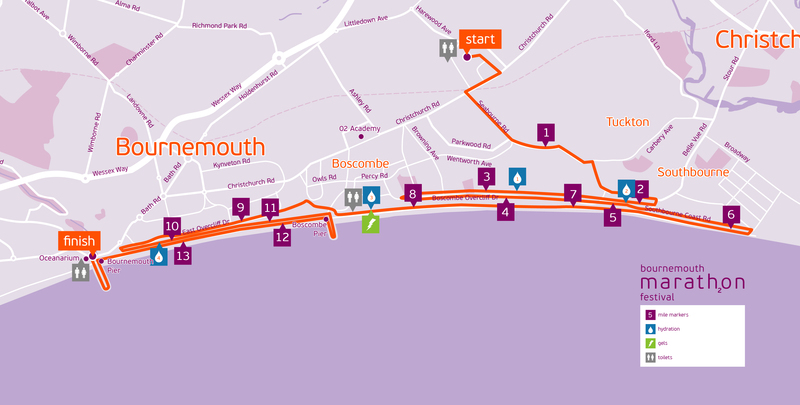 The Bournemouth Half Marathon course follows the Full Marathon route, taking in both Boscombe and Bournemouth piers along this coastal route. This is running as it should be! I loved every second on the half marathon - fantastic scenery, brilliant atmosphere and great support from the race crew and everyone in the crowd and lining the route. Can't wait for next year! Glorious day for the BMF half marathon - fabulous location, great atmosphere, unrivalled support teams and generally wonderful experience. Thank you Bournemouth. 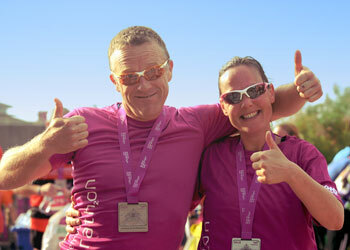 @RunBournemouth you did a great job. Fab organisation. Stunning scenery. Inspiring to see so many different people loving their running! @RunBournemouth best half marathon that I have run. 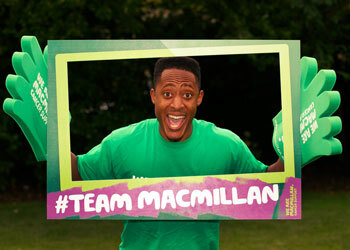 Great atmosphere, great support, great medals. Just great around. Fabulous weekend, brilliant organisation, well marshalled cheery and so encouraging and enjoyed every moment. Will be back. Runners were amazing and would be crazy not to include this one on their next year's race event itinerary. Well done to everyone! Crowds and marshals were the best I've ever seen today, well done to everyone involved, fantastic! Water station crews amazing as welll. The Bournemouth half marathon route follows the full marathon route, starting in Kings Park before making it’s way down onto the seafront. You continue to take in the beautiful coastal views as you hit mile 6 – standing mid way between Poole Harbour and Hurst Spit, Hengistbury Head forms the main division between Poole and Christchurch bays. You then turn west and at around mile 8, you run along the breathtaking Boscombe Pier. The Pier was first constructed in 1856. The Pier has undergone numerous transformations over the years, with the addition of the Bournemouth Pier Theatre in 1959. You then run past Lower Gardens at mile 10 before the final home stretch along the stunning coastal seafront and a grandstand finish. An impressive all-weather facility, with a full range of track and field equipment available to hire. It’s home to the Bournemouth Athletics Club and hosts regular competitions and events. The centre includes an all weather track, cross country course, weights room and a throws area. You can watch events from the covered stand and get refreshments from the cafe. Take in these beautiful views as you hit mile 9 on the coastal marathon route. Standing mid way between Poole Harbour and Hurst Spit, Hengistbury Head forms the main division between Poole and Christchurch bays. Run along the breathtaking Boscombe Pier at Mile 9. The Pier itself has stood on the site since 1889 and was declared ‘Britain’s Coolest Pier’ by Wayne Hemingway in 2009. At Mile 10 you can see the famous Russell-Cotes Art Gallery & Museum. Situated on Bournemouth’s stunning cliff-top, over looking the sea, this exotic seaside villa has been sealed in time creating a unique atmosphere in a most dramatic setting. As you hit the iconic Bournemouth Pier, you know you’re on the home stretch. The Pier was first constructed in 1856. The Pier has undergone numerous transformations over the years, with the addition of the Bournemouth Pier Theatre in 1959. 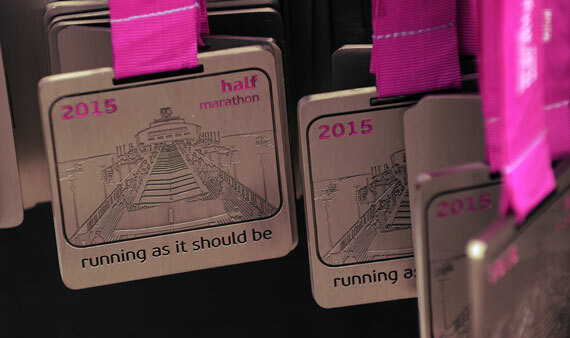 The most beautiful sight for any half marathon runner – the finish line at the Lower Gardens! Landscaped in 1871 after a competition was held by Bournemouth Council to design the new gardens, most of the Victorian splendour still remains today.